INTRODUCTION - WHY 72 HOURS? For the first time in my life, I recently went 72 hours without eating or drinking anything other than water, and a little mineral sea salt. Back in April, I completed a 48 hour fast as part of a bigger challenge, during which time I also fasted from anything digital, and spent two days in solitude. The whole idea of that was to reduce any stimulation for two full days, as a means of learning about sensory input, mindfulness and consciousness. This recent fast wasn’t as much a journey of the mind as it was a journey of the body. Not long after my earlier 48 hour fast, I read an article explaining that the University of Southern California had made a breakthrough, understanding fasting for 3 days can possibly regenerate the entire immune system. I was frustrated because I felt I could’ve easily continued for another day at the end of my 48hrs, and knew I’d come back to this at some point. There is a process in the body that takes place during fasting called 'autophagy'. "This is the body’s mechanism of getting rid of all the broken down, old cell machinery (organelles, proteins and cell membranes) when there’s no longer enough energy to sustain it. It is a regulated, orderly process to degrade and recycle cellular components." So when you come out of the other side of a fast feeling like a new person, that is in part literally true! Matters of the immune system are particularly close to my heart, as in my early 20s I suffered from an auto-immune disorder, Rheumatoid Arthritis. This lead my life to spiral out of control, giving up on myself, over eating, becoming isolated and 100 lb overweight. I eventually hit a rock bottom so hard that the prospect of living another 40+ years obese and in chronic pain became an impossibility. Those circumstances HAD to come to an end by any means, and thankfully I sought a positive solution in testing out alternative health measures. I won my health back. Through a 60 day juice fast and a trip to the Amazon to be treated by the indigenous plant medicines there, I’d managed to become symptom free and better still, stop taking the pharmaceutical drugs that were so strong I was required to take a blood test every two weeks. I came back from the jungle inspired to help others, but I also understood that my path wasn’t one easily followed, nor would it be appropriate for most others. In the year that followed my return from the Peru, I set about uncovering a more conventional path to well rounded health, happiness and wellbeing. I become qualified as a Holistic Lifestyle Coach with the Chek Academy Europe, based in Lancashire, England. I discovered 6 pillars of health upon which I based my Six Week Shift course around, but I knew deep down there were more levels to what I’d achieved with my own health and continued exploring. Eventually, I discovered the Wim Hof Method. I took this 10 Week online course of breath-work, stretching and cold immersion training and couldn’t believe the results. My cardiovascular fitness greatly improved, I reached places in meditation that I didn’t know existed, I grew resistant to the cold and could hold my breath at least twice as long as when I started the practice. I connected with some incredible people through the WHM community, who really inspired and encouraged me to start telling the story of my personal health journey to help others. This is when Causeway Living was born, September 2016. In the year or so that followed, I developed a more complete path to wellbeing than 6 pillars of health. I’ve come to call this path the Pyramid of Balance, as I believe that balance is the highest attainable value: peace and contentment. Upon the 6 pillars of health, I placed 3 pillars of strength and above that the pillar of happiness: self-actualisation. That which ascends even the pyramid is Balance, something I’m not certain can be permanently attained, and is a constant work in progress. Six Week Shift covers the 6 Pillars of Health and moves up into the first Pillar of Strength: Human Connection, by offering group accountability for the tasks and challenges set throughout the course. The Giant Awakening Mountain Retreats offer an experience in The Cold, The Wild, The Others: the 3 Pillars of Strength. The as-yet-unreleased new Causeway Coaching program will look at self actualisation: doing what you WANT with your life - the Pillar of Happiness. This will include Heart, Vision and Speech as a means to ascend the top of the pyramid, and begin looking at how to bring all of the below into balance with relationships, family, friends et al. All of the above is to provide some context about my constant strive to understand the mind, body and even ‘spirit’, as a means to develop the most simple and accessible development paths for others to benefit from. Essentially learning the hard way, so you don’t have to. I’m my own human experiment and usually trust my intuition as to which trials to put myself under. Extreme cold, hallucinogenic plant medicine, extended fasting, they've all carried risks but worked out well so far, and this 72hr water fast just was the latest in line of self experimentation. I took some important lessons from the 48hr isolation challenge / fast that I did earlier in the year. If I was going to go 1/3 longer on the fast, I figured the distraction of technology and the connection to others would be important, so I decided to forego isolation and just focus on body, undergoing the fast and seeing how it would make me feel. As I mentioned, this is something I’ve wanted to do for quite a while, and all of the circumstances just fell into place for me to take the decision to begin on short notice. I’d just completed the last Giant Awakening retreat, had a few days to recover from that, and a few days before my next Dash & Splash event. My first step was to use one of the the greatest tools I’ve uncovered in my personal journey - accountability. Just as when took on the 10 week Wim Hof Method online course, I announced on social media that I would a 72hr fast. In doing so, I harnessed my own ego to drive myself to something positive. I didn’t want to be the guy who runs his mouth, taking on a big challenge only to drop out half way through - and that would help me stick to it. This is why I make human connection a key part of Six Week Shift, that extra accountability is extremely useful in trips beyond the border of the comfort zone, where it’d be otherwise quite easy to turn and run back. I felt confident, having taken on other big challenges of the sort and knowing from experience that I've got the willpower to do it. I never questioned whether I would or wouldn't complete the fast, but there was a question of how well I would complete it. I wanted to be smart about this, so I took lessons from last time, did extra research, and spoke to others who I know have fasted for a long time to see how I could minimise the negatives of the experience and capitalise on the benefits as much as possible. On my earlier 48hr fast, I suffered a really bad headache on Day 2. At the time, I assumed this to be some kind of withdrawal, but as I try not to go into any of the delicious bad things like sugar, saturated fats, salt, caffeine etc. too hard, I was pretty surprised and curious as to what I was actually in withdrawal from! More research tells me that it was more likely the headache came from dehydration, as despite drinking A LOT of water in those hours, my body lacked the minerals it'd normally pick up from food to help me absorb it, so the water mostly just passed right through. On this fast, even though I'm lucky enough to live in a place with great quality tap water, I stuck exclusively to mineral water. To top this up, once or twice a day I'd add a little pinch of mineral salt, no matter how unpleasant it tasted. Like most treatments that taste horrible, it was good for me! I managed to get through the whole 72 hours without the same headache as the first time. This was the only major positive change from the prior fast. As part of my daily routine, I was already taking a lot of steps that would benefit my wellbeing during the fast; the positive habits I help others to generate as part of Six Week Shift - daily stretching, breath-work and meditation, staying hydrated and laying off the blue-screen devices in the evening to help prepare the mind and body for a decent night sleep. Talking of sleep.. there was plenty of that going on, especially around Day 2. A very early night sleep at the end of the first full 24hrs, and two long naps on the second day, followed by another early night sleep. I was in a really low-energy state with zero caloric input, so I assume sleep was my body's way of conserving energy. I felt really positive about this because sleep is also the time in which you body does most of it's healing, physiologically and psychologically, and I was hopeful that the cellular renewal process of autophagy was taking place as I slept away the hungry hours. I use the word 'hungry' pretty lightly.. and this was my biggest surprise from the 48hr fast I did before. At no point was I doubled over, clutching my stomach with hunger pangs and pains. Sure, I was hungry. Sure, it'd have been nice to eat something. But if you can just witness and accept that feeling, know it's not hurting you, it's ok. Extremely similar to working with cold water immersion, and perhaps that experience had benefitted me psychologically before starting. I really thought the hunger would be much worse but you'd be surprised how manageable it is. The worst of the experience is the feeling of low energy. Don't think about trying to do anything too physical when you're fasting for an extended period of time. With no calories going in, you simply won't have the strength. Further into the fast, it became harder to concentrate on mental tasks too, so I probably wouldn't advise driving or putting yourself in a situation that would be dangerous in an altered state such as drinking alcohol. Ultimately, the final few hours were the toughest. With the finish line in sight I started thinking more and more about food and breaking the fast (break-fast, breakfast). Weak thoughts infiltrated my mind like "ah go on, only 6 hours to go, nobody will know either way" - not that 'people knowing' is anywhere near the point of fasting in the first place! But I'm really glad I persevered and fulfilled my intention of going 72hours on water alone. After three full days of not using your digestive system, it's extremely important not to give into you most base instinct of grabbing the largest burger you can get your hands on or getting a second wind of energy to run to the nearest pizza hut. My research and speaking to others told me that method of breaking a fast is one you will suffer for with a really upset stomach. I opted for a cold pressed Kale, Spinach, Pear, Apple, Lemon, Kiwi, Broccoli & Banana juice to dump as many micronutrients as possible back into my system, but not long after couldn't resist heating up a little shepherd's pie my girlfriend made for dinner earlier too hah. The following morning I had Dash & Splash to host, back to 'normal' with a bang! I was a little concerned that the feeling of low energy might persist and I wouldn't be at my best for this event. I was even prepared to eat something that morning even though I normally only ever run and swim early on an empty stomach, but when I woke up Sunday bright and early, I felt really good. I didn't feel hungry and went into what was a cold and windy morning feeling good. My good friend and regular Dash & Splasher, Dan had signed up for Run in The Dark, a 10k charity run with over 3000 people in Belfast, only to fall sick the week before. So on the Wednesday following my fast, I would become 'Dan Trimble' for the evening and take on my first ever running event! Not one to do things by half, I decided to run it 'barefoot style' in my Luna running sandals too. I really didn't know what to expect as I rarely if ever run more that 5/6k, but with a chip time of less than 53 minutes (just) on a really hilly course and placing #312 out of over 3000 runners I was really happy with the result! I don't know how much of the running event going well I can put down to the fast, but what I can say is that I felt good and capable and full of energy, having only days before gone three entire days without eating a single thing. I take this as a pretty great indicator that an extended fast is something safe, positive and healthy at least for me personally. It's important to remember that fasting isn't for everyone though e.g. If you're taking pharmaceutical drugs you may need to keep food in your body so the drug doesn't have adverse effects. I will do a 72 hour fast again some day, but not in any hurry. It's tough to take time out from the beautiful things in life like exercise, food and more. 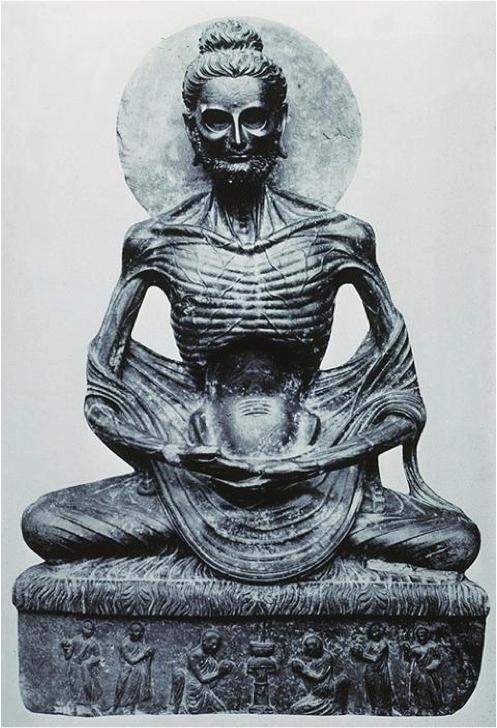 There is a little-known representation of the Buddha known in the west as an Emaciated Buddha. It supposed to represent the 'middle path' and not taking things to extremes. Balance. On his journey to enlightenment, Sidharta (who would become the Buddha) starved himself for six years, before coming to the conclusion that ascetic extremes are not the way. I forgot how unpleasant it can be in such a low-energy state and being unable to do the things you want. It reminds me a little of when I was still suffering from Rheumatoid Arthritis and 100 lb overweight, the fatigue was almost as debilitating as the joint pains or depression. I have renewed gratitude for being fit and healthy again, with incredible people around me after years of solitude and suffering. Sometimes it's easy to take the most important things for granted. I still feel great as a result, and whether that's the autophagy response of the body to fasting and the renewal of my cells, or the simple fact I took 3 days to physically rest and got more sleep than normal, it's hard to say but probably a combination of both. If it's something you want to try out, sign up to the mailing list below as I'll be hosting a group 24hr fast sometime over the Christmas period when everyone will be more in need of giving the digestive system a rest than ever! Want a report on another one of my adventures? Click here for a write-up on my experience with the Peruvian plant medicine; Huachuma.